Some Hamilton models come in different varieties… different case materials and different dials made for sever different combinations. A good example is the 1955 Amherst. It was introduced in 1955 and produced though 1960. 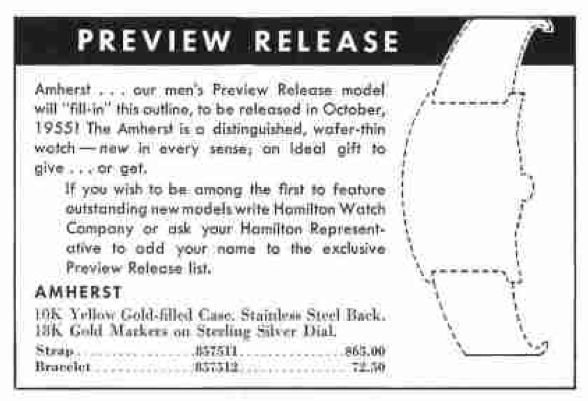 The Amherst was a late introduction into the 1955 Hamilton line-up and showed as an empty outline in the 1955 catalog. It's funny that the outline doesn't really match the watch though. 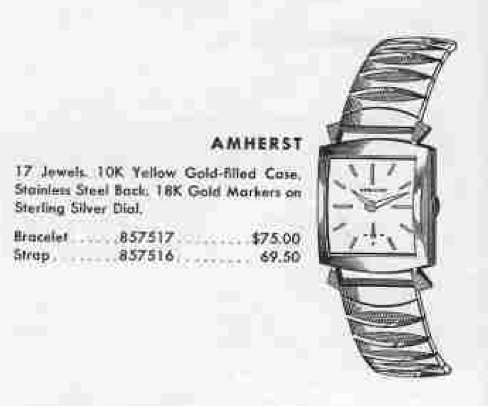 Initially the Amherst came only in yellow gold fill, with a stainless back and a white sterling silver dial with 18K gold markers. 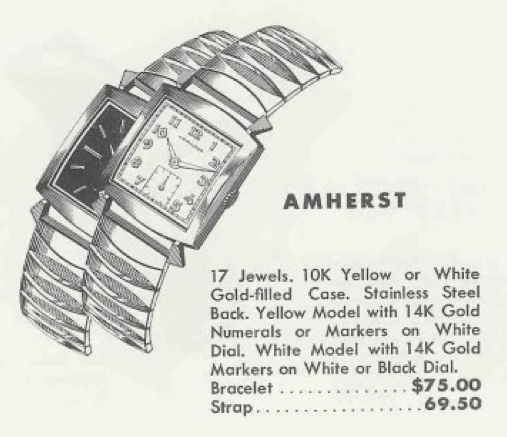 But but 1960, it was available in white or yellow gold filled and there where white or black-finished dials and dials had solid 14K gold numerals or markers. Behind the dial of an Amherst is Hamilton's 8/0 sized 730 movement. This movement replaced the 747 in 1955 and since the Amherst showed up late in the year, I suspect you won't find 747-based Amhersts but it's possible that an early Amherst could get a 747. My project Amherst was well loved, I think. It shows a lot of bumps and bruises but it's not overly worn in any particular areas. It could stand a good cleaning though - that's for sure. The stainless steel back is inscribed with a name and a date from 1959 - thus dating this watch to early 1959. With the bezel removed, the dial appears to be original and looks like it's in nice shape. Hopefully a little cleaning will brighten it up even more. The 17 jewel 730 movement is a fine, American made movement. It's basically a 747 movement with shock jewels to protect the balance staff. You can see the little gold spring clip on top of the balance cap jewels. While everything is being cleaned in the ultrasonic, I'll prep a new glass crystal for installation. The movement is cleaned and reassembled with lubrication in all the jewels and high-wear areas. Then the movement is placed on the timer so I can see how it's running. A little tweaking is all that's needed to get the timing to level out nicely. The beat error of 3ms is on the high end of acceptable. I'd like to see it lower but adjusting it is a pain and risks goofing up the hairspring. Sometimes it's best to let sleeping dogs lie. The beat error might cause the watch to stop running after 40 hours instead of 42 hours but other than that it's not too impactful. The dial and hands get reinstalled and it goes back into the polished case, outfitted with a new glass crystal and nice black lizard strap. As you can see, the dial cleaned up very nicely… some minor marks here and there but certainly not worthing of being refinished. This watch is ready for another 50 years of faithful service.